Experience horse riding in the heart of Andalusia at the only equestrian vacation centre in Spain approved by the British Horse Society. 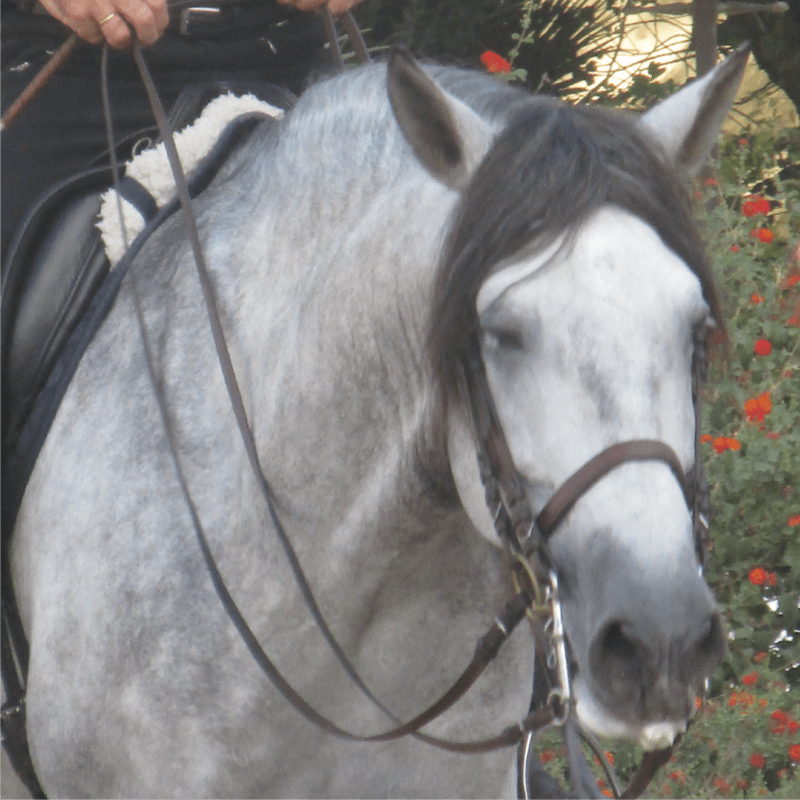 The riding program offers trail riding, high school or Classical Dressage on Andalusian horses, where beginners and advanced riders can enjoy the pleasure of riding superbly schooled horses. Your instructors and trainers have vast experience and the highest qualifications. Sample the Spanish hospitality and immerse yourself in the delightful Spanish culture. 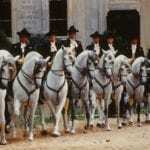 Your tour also includes a visit to the famous Spanish riding school in Jerez. We offer three unique horse riding holidays to beginner and advanced riders, depending on your interests. The usual program includes trail riding in the morning and dressage lessons in the afternoon, but if you prefer a dressage intensive program, dressage lessons, plus some lunging lessons, are provided, which are excellent for improving seat, balance and posture. All riding programs are designed for riders who want to concentrate on improving their riding skills, while learning from top class instructors on sensitive horses. 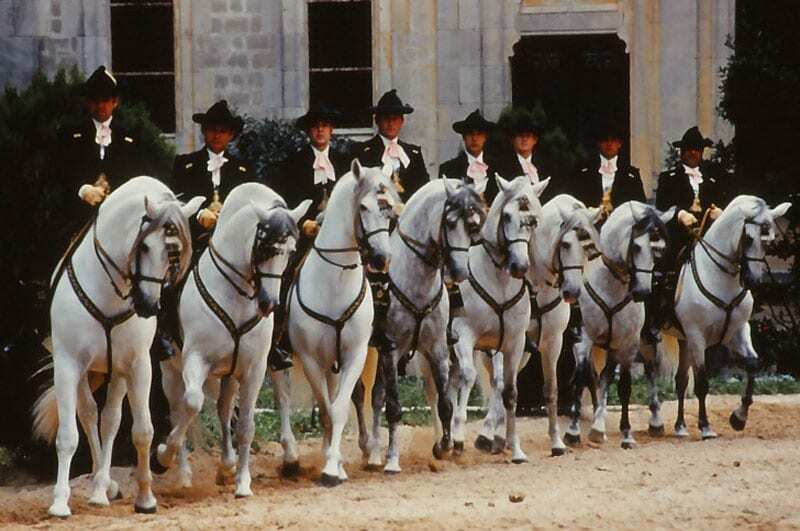 The horses are mostly Andalusian and Andalusian crosses with a few Lusitano’s and Warmblood’s. The riding tack is English. This is a supreme dressage intensive holiday for riders with a passion for the sport. Ride some of the most advanced movements, including Passage, Piaffe and Spanish Walk. This riding program is an incredible opportunity to train with Rafael Solo, a true master of dressage. Your lessons with Rafael are towards the end of your week’s stay, so you will have already formed a great relationship with your horse and are able to do some work on your riding beforehand. Elementary knowledge of dressage is recommended for maximum benefit. There is also dressage intensive programs available for those that just want to improve their dressage skills. Please enquire for further details. This is a 6 night, 7 day horse riding holiday designed for those who share a true passion for horses and culture. The combination of trail riding and training is ideal for riders who value a mix of relaxed riding and improving their riding skills. Your confidence in and enjoyment of horses will increase greatly during your stay. This unique tour includes four riding lessons and four trail rides in the beautiful Andalusian countryside, including a ride in the national park along the beach. There is also the option to visit the Royal Andalusian School of Equestrian Art in Jerez, and a Flamenco dancing show and dinner in Seville. You will be staying in the charming medieval Andalusian hillside town of Carmona with cobbled streets and a quaint town square. The only noise that you’ll hear at night is the chiming of the church bells. The Hotel Alcázar de la Reina is centrally located and is a lovely four star hotel, which is tastefully decorated with a pool, two restaurants and a bar. The town is pleasant to wander around at night and easy walking distance to many restaurants and tapas bars. A great way to finish the day after a hard days riding is to relax and enjoy a glass of wine or Sangria in one of the many bars or restaurants. Carmona is just a short 15 minute drive from Hacienda Seville. The hotel in Carmona provides a hearty breakfast with plenty of choice. Lunch is local delicious home cooked food at the farm with two courses including local wine. Every Friday the cook makes traditional Spanish Paella and Sangria as for most this is the last meal at the farm and its a chance to celebrate a wonderful week of horses and new found friends. After you have eaten a large breakfast and a good lunch a small tapas and a glass of local wine in a local restaurant in the evening is all that is required to finish the day. Carmona is in Andalusia, Spain, approximately 30 minutes by car from Seville. The closest train station and airport are both located in Seville, Spain.